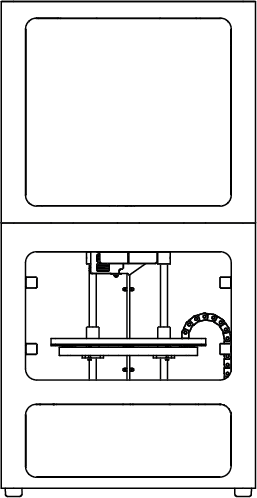 When printing parts using the Fused Filament Fabrication (FFF) process, hot material is extruded through the print head onto the print bed or the part. The hot material is very flexible and needs to adhere to a solid surface or it will sag, rather than hold shape. 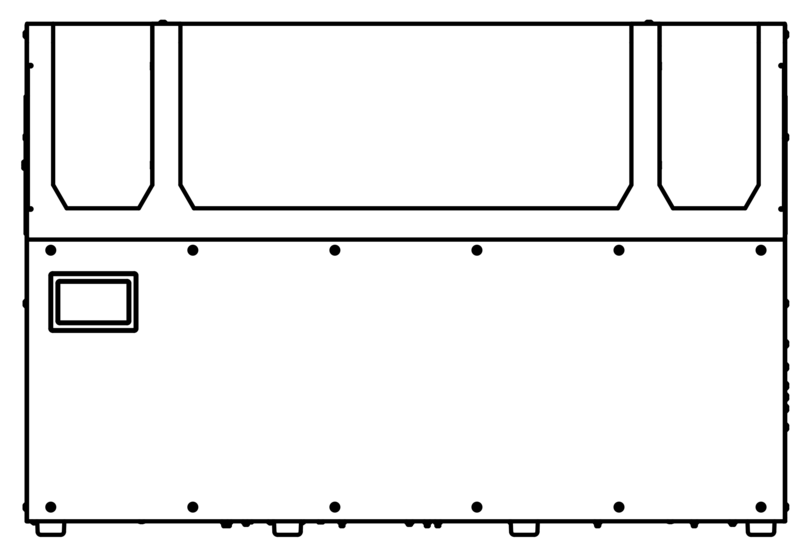 On the first layer of a part, the print bed is the solid surface onto which material is extruded. For parts that build straight up, or have a wider base than upper layers, the previous layer becomes the solid surface as it cools or becomes more rigid. But for arches, flanges, or other overhanging features, the plastic needs something additional to serve as a surface to adhere to. 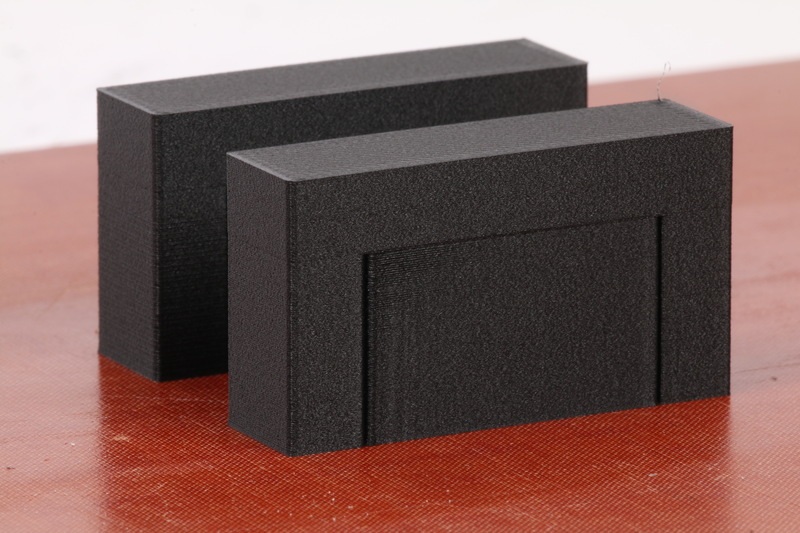 In these cases, Support Material is built up with the part to provide a surface for the overhung features to print on. Supports are printed in the same plastic material as your part and are easy to break off after printing, allowing you to print complex geometries while still achieving part accuracy with minimal post-processing. In Eiger, users can enable or disable supports for any part. If the “Supports” toggle button is enabled for the part, Support material and tool paths will automatically generate under any overhang that will require supports to be successful. For Onyx, any feature that is greater than 45 degrees from vertical will require supports; for Nylon, supports generate under any overhang that is greater than 30 degrees from vertical. Supports generate under overhangs and features in a pattern that is less dense than the typical wall and infill patterns used in actual parts. Supports will generate as an accordion pattern of single walls that can be easily snapped or peeled off the finished part. Further, there are occasional instances where users may want to change the angle, in the XY plane, that the supports generate in. 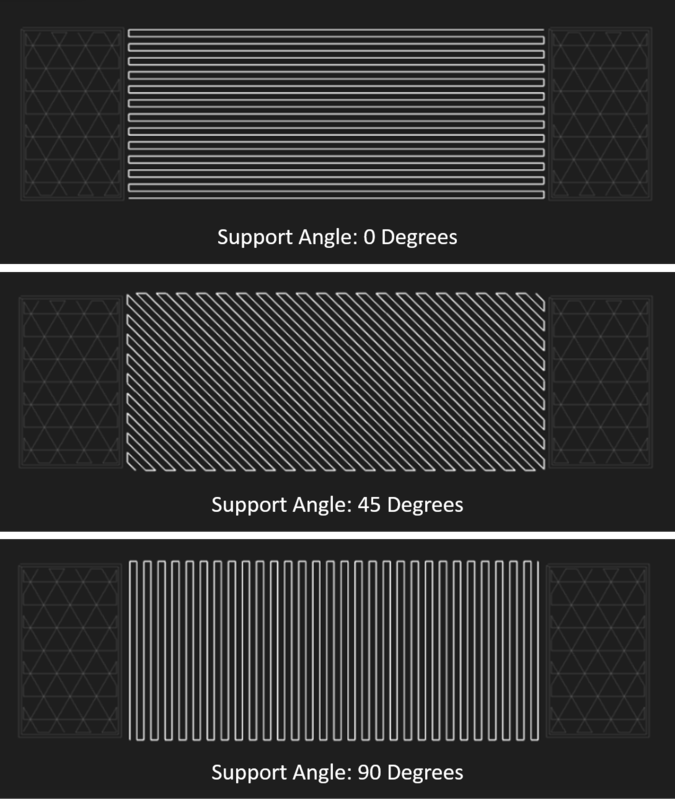 If that is the case, the XY angle of the support tool paths can be controlled with the “Support Angle” field in Eiger's “Part View” page. For normal support patterns, a Support Angle of “0” means that the support tool paths will run parallel to the X-axis. Turbo Supports are a step up from the way supports are traditionally printed. Parts that have large overhangs or unsupported cavities will require a lot of support material to be successful, which will increase the printing time and cost for the part. Turbo Supports will help cut down on the time and material used to print support-heavy parts by using a different tool path pattern. Turbo Supports will print more sparsely for the majority of the print and will then change to a tighter pattern as the supports get closer to the floor of the supported feature. The sparse support sections will provide the needed strength and stability for the part but will print much faster than a traditional support pattern. The tighter support pattern will look very similar to normal supports and is intended to bridge the gaps between the more sparse support sections to provide a very stable surface for the floors to generate over. Turbo Supports, like any other tool path or layer information, can be viewed in your part's Internal View in Eiger. 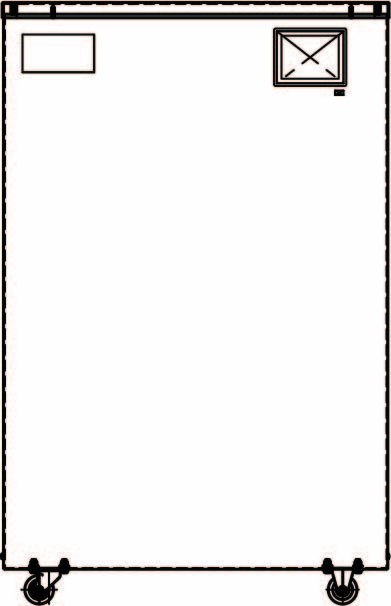 By default, Support tool paths are generally disabled for viewing, so they will show up as ghosted white lines. The tool paths can be enabled for viewing by expanding the “Visibility” menu and clicking the icon next to “Other”. Turbo Support tool paths will show up in every other layer in the internal view. The Turbo Support lines will be rotated 90 degrees from the “Support Angle” value that was designated on the “Part View” page. The final section of supports will generate at the designated “Support Angle” and will be anywhere from 8-60 layers tall, depending on the layer height, part geometry, and print settings. To enable or disable Turbo Supports, click the “Turbo Supports” toggle button under the “Advanced Settings” drop-down in the “Part View” screen. 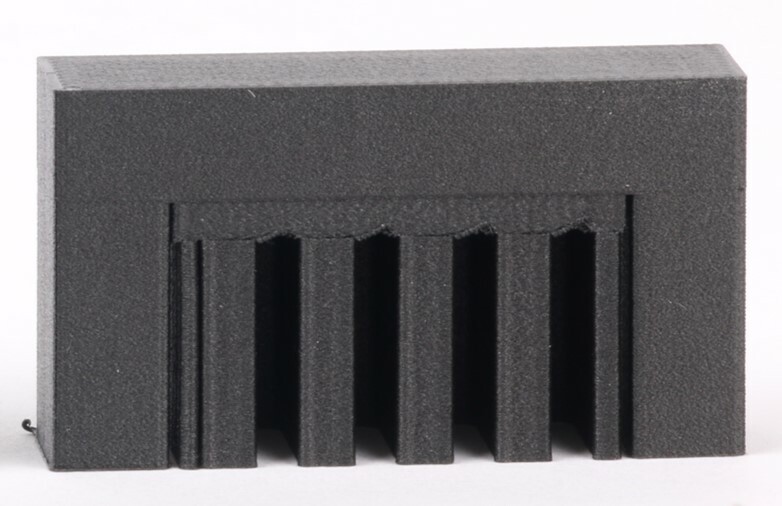 Print on a flat base: Orienting your part in Eiger such that a flat surface is printed directly on the print bed can help minimize the amount of supports needed, which can increase the surface quality and the success rate of the part. Use the Snap to Rotate tools in Eiger to ensure your part is oriented appropriately. Print with a brim: Printing with a Brim will help with support adhesion to the print bed. Tall, skinny sections of Supports can fall over or fail during printing if they don't have good adhesion, so adding a brim helps secure those sections and provide part success during printing. Orient parts to minimize supports: Different orientations of parts will require higher or lower volumes of support material to be successful. Orient parts such that all features are organic. If it is not possible to completely avoid printing with supports, orient parts such that supports are minimized. 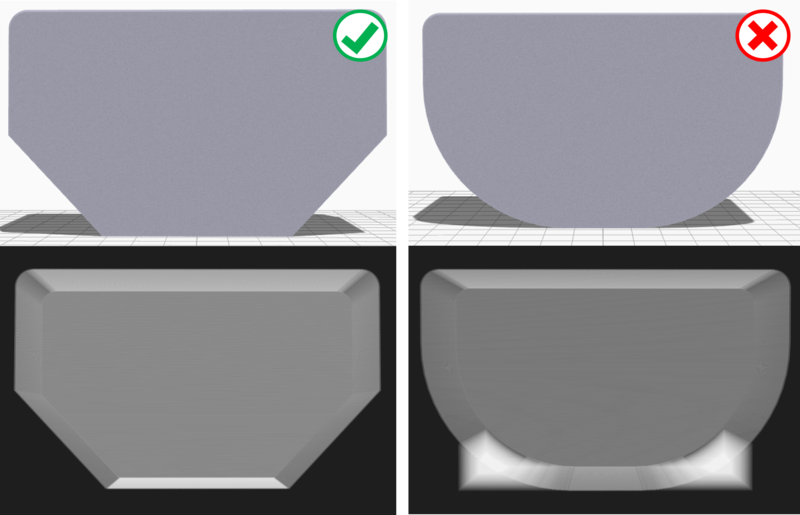 Design smart overhangs: Creating parts where all of the overhanging features are at angles smaller than 45 degrees will eliminate the need for supports to be printed at all. Use teardrop shapes with chamfered tops for holes. Fillet tops work well on external geometries. 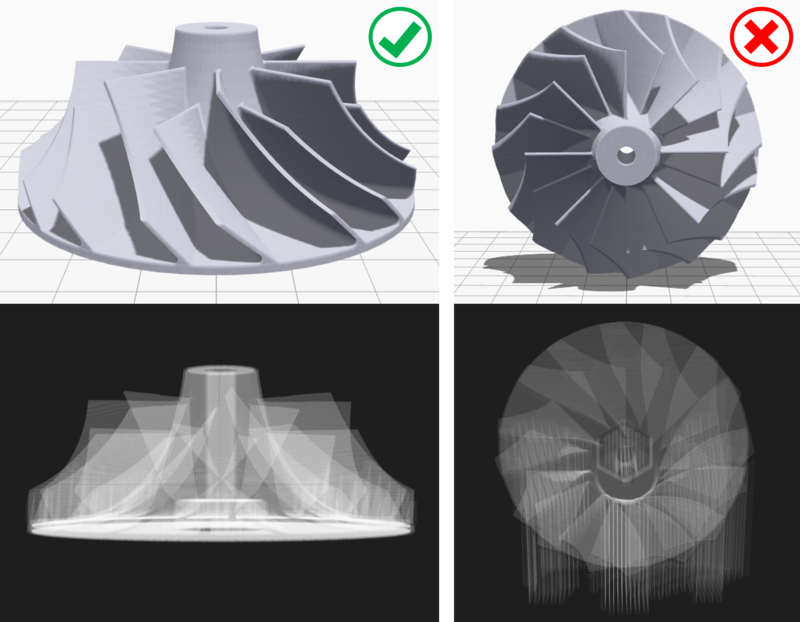 Avoid fillets on the bottom of the part: Fillets, as with any curved surface, have non-constant angles and will therefore require supports on the bottom half of the curve, resulting in a higher chance of print failure and poor surface quality if the part does succeed. Printing chamfers at appropriate angles instead will eliminate the need for supports and will make for better printing, overall. Include your own custom supports/blocks: If you cannot completely adjust all geometries that will need supports, or if you only want to have certain features supported, consider creating your own support blocks or patterns in CAD and printing with Supports turned off. 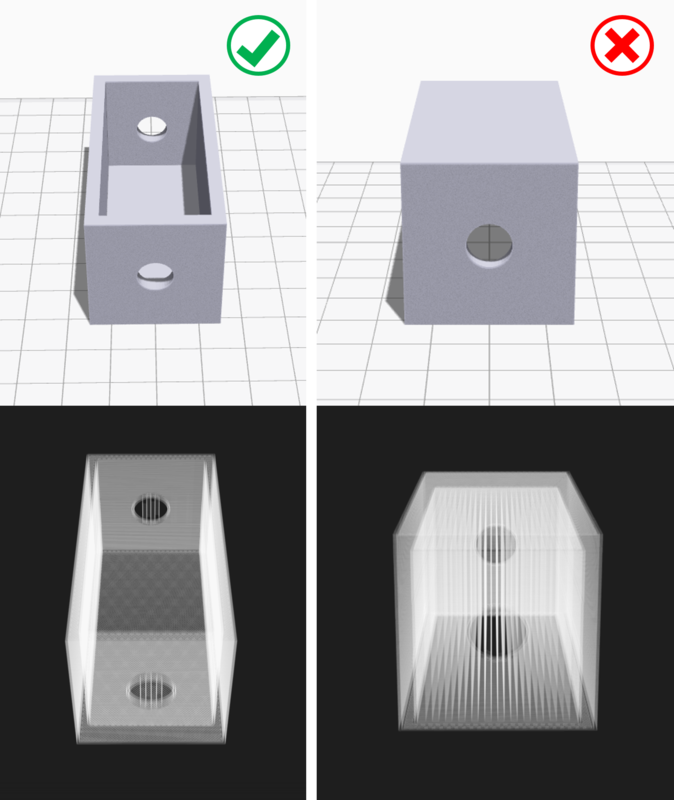 Creating custom supports in CAD requires forethought into how the blocks will be designed such that they are able to support the part while still being easily removed. Consider using thin lines, around 0.8mm-1mm in width. 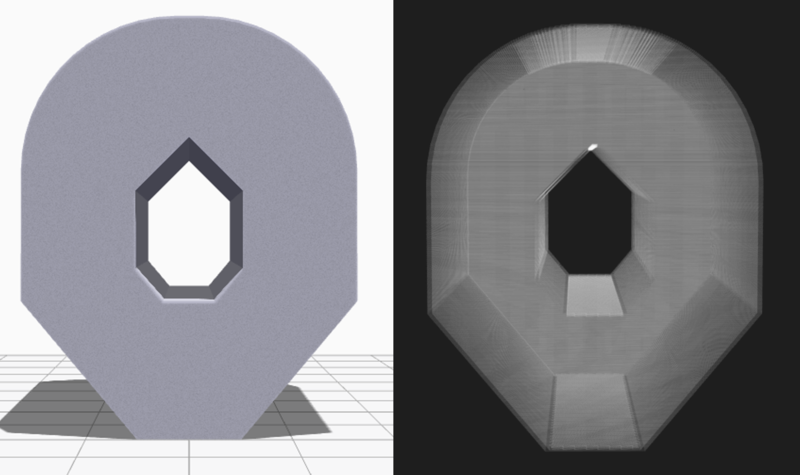 When creating custom supports, the best quality will be achieved if both the part and the supports/blocks are imported into Eiger together, as a single STL file. Parts that are printed with Supports will generally show a slightly worse surface finish than the rest of the part, as the thermoplastic doesn't have a totally flat base to print over. Wet sanding is the suggested post-process method. clean up or post-process features that were printed over supports. For wet sanding, use a high grit (220 or higher) sand paper. For best results, apply water to the part and sand in smooth, light motions until the desired surface quality is achieved.